Arya has become fascinated with other babies. Whenever she see another baby, whether in person or in a picture, she stops moves and stares intently. 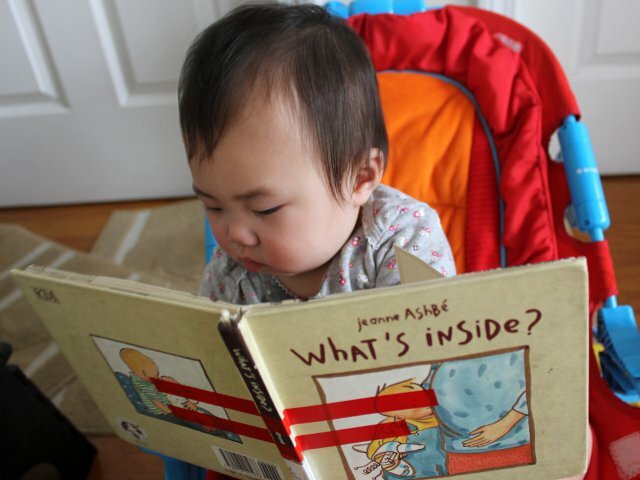 Since she is attracted to pictures of babies in books, I thought What’s Inside by Jeanne Ashbe would be a great book to read to my daughter. The front cover shows a baby kissing his mommy’s pregnant tummy. What’s Inside has a cute premise. Each of three groups of pages starts with a chapter summary providing an overview of the three pages to come. The subject pages show a picture of one object on the front cover of a flap. The flap opens to reveal the inside of the object. The first group consists of a suitcase, present, and watermelon. The pictures under the flaps show packed clothing, a stuffed animal, and the inside of the watermelon. The second group is comprised of a teddy bear, television, and ball. Whereas the first group was made up of objects that people want to open up, the second group shows objects nobody wants to open up. The last group of pictures show a mommy in different stages of pregnancy. The flaps reveal identical pictures of the mommy’s belly partially transparent to reveal the baby growing inside. Arya loved the lift-the-flap design and she eagerly played with every flap to the point of not wanting to turn the pages. I thought the theme of “looking inside” was quite novel for a baby board book. The basic illustrations are not as colorful or dynamic as with other children’s books, but they do serve the purpose of showing readily identifiable objects. Since my daughter enjoyed playing with the flaps so much she didn’t pay much attention to any of the individual images. What’s Inside is a terrific book for any fan of the lift-the-flap concept. Older toddlers will be delighted at the thought of being able to look inside. Even school-age children will like seeing the inside of a pregnant mommy’s belly. What’s Inside costs (including shipping) under $10 new and under $5 used.